Nothing adorns a garden better than one of these find handcrafted bird houses on display at the Saturdays Market in Fredericton, New Brunswick. 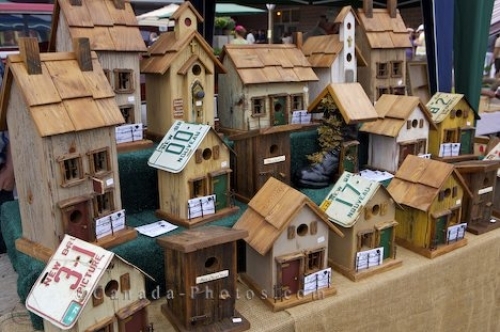 A market stall set up at the Saturday Markets in downtown Fredericton in New Brunswick, Canada displaying beautifully handmade bird houses. For bird lovers, each of the bird houses has been individually made and the assortment to choose from is plentiful. Bird feeders/houses for sale at the Saturday Markets in downtown Fredericton, River Valley Scenic Drive, Highway 2, New Brunswick, Canada. Picture of an assortment of unique bird houses at a market stall at the Saturdays Market in New Brunswick, Canada.